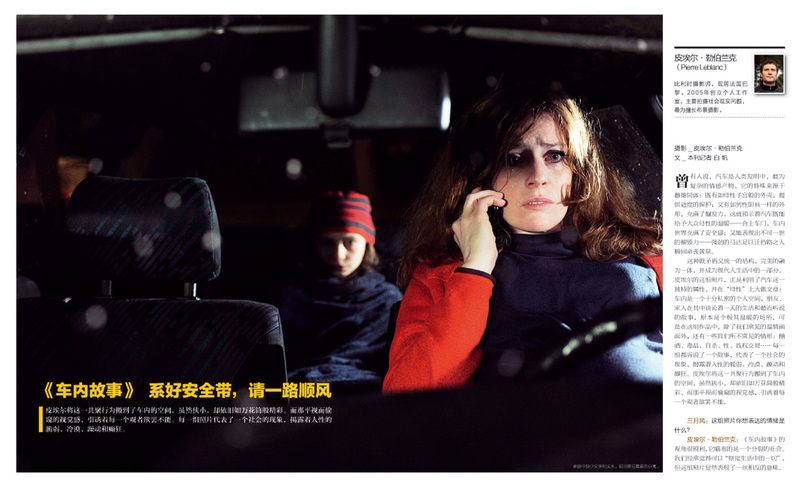 Publication en Chine dans Qidye Magazine. A sharp look on a cracked up society. If the expression « to be driving » often means that we are “master on board”, having control on our lives, I show here that it’s not always the case. As in the backyard of a mansion or the backstage of a theater, I propose through this series a point of view on what escapes most of the time to our eyes. Who has never dreamed of being invisible to be able to see forbidden scenes? Cars cockpits are the set I use to depict our deepest states. Stopping the time in this private space, “Insides” reveals us as behind closed doors, the intimacy of drivers and their possible passengers, either it is made out of nice, absurd or horror. New, second-hand, rented or stolen, the car- as a mirror-carries us as the body is the vehicle of our souls. This systematic artwork delivers us human being in all its states. This was our editors’ pick of the week. 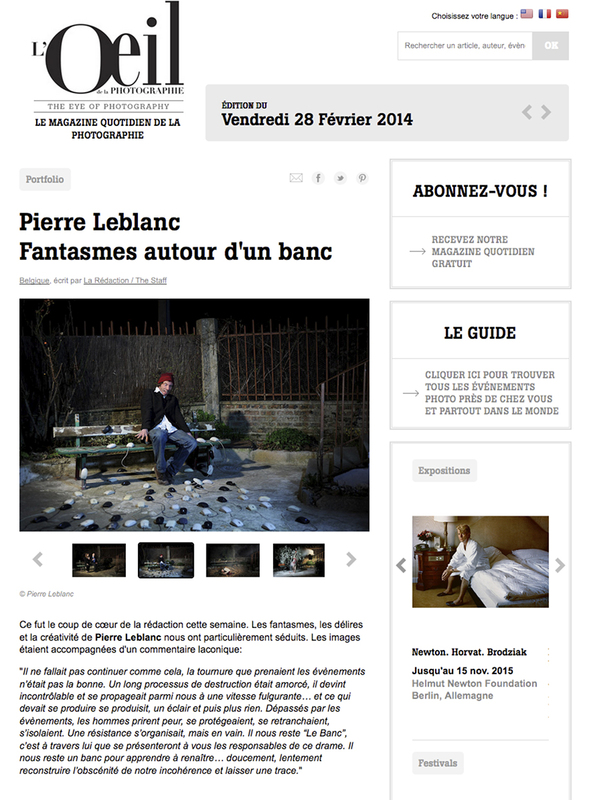 The fantastic, maniac creativity of Pierre Leblanc’s series Le Banc (The Bench) was particularly impressive. In the construction of his human comedy, Pierre Leblanc culminates in the coherent conciliation of social and artistic dimensions. This balance is pretty rare to be indicated. More than a moralist, Pierre is an inspired aesthete who invents the visual pamphlet. He exhausts and sends signs of solidarity, messages of tenderness, he carries by the picture, in a brutal and incisive way, noble ideas, he does not hesitate to intersperse its visual declarations of unusual and funny bombs and on the stage of its objective, all the human theatre is played, sordid to funny, vile to poignant. Everything is played out, everything takes place in the great human barnum, splendour and misery. Everything, with an acuteness, a devastating efficiency, is said about the being: the monster, the fallen angel, the animal, the meat, the flesh, the cold vertebrate, the ugly, the soiled, the malicious, the puppet, the shiver, the emotional, the misfit, the overwhelming… Work also consists of uncompromising radiography of humankind. Nouvelle publication en Chine de la série "Intérieurs", cette fois dans le magazine "Spring Breeze" un article de 4 pages sur mon travail et 8 photographies de la série. If the expression « to be driving » often means that we are “master on board”, having control on our lives, I show here that it’s not always the case. As in the backyard of a mansion or the backstage of a theater, I propose through this series a point of view on what escapes most of the time to our eyes. Who has never dreamed of being invisible to be able to see forbidden scenes? Cars cockpits are the set I use to depict our deepest states. Stopping the time in this private space, “Insides” reveals us as behind closed doors, the intimacy of drivers and their possible passengers, either it is made out of nice, absurd or horror. New, second-hand, rented or stolen, the car- as a mirror-carries us as the body is the vehicle of our souls.